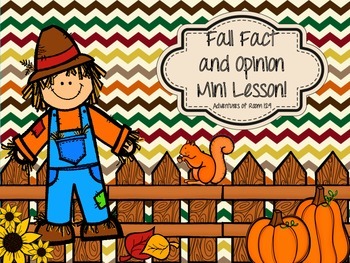 This mini lesson is designed to be a nice, quick review lesson - great for any classroom! The lesson has 4 parts. 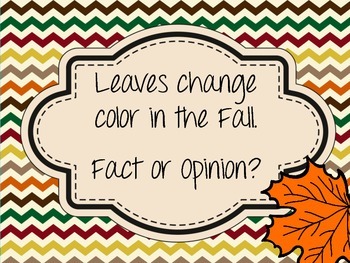 A fun fall picture is provided to help begin the fact/opinion discussion. A 1/2 page teacher modeling ws is included to model the objective. 6 pages (slides) are included to show students and discuss. And finally a 1/2 page student assessment is also included. The only part you would need to do/make is have either a cute fall cut out (leaf, pumpkin, etc.) 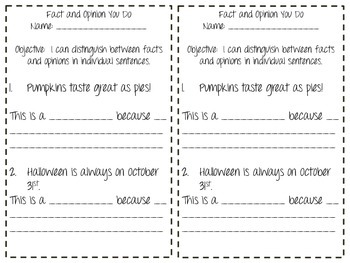 or an index card for each student. 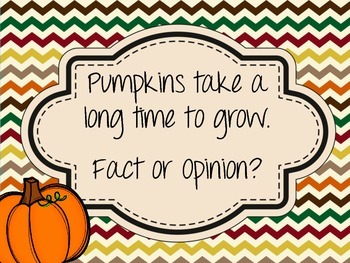 Write on one side "Fact" and the other "Opinion". You will use these during the ppt section of the lesson.